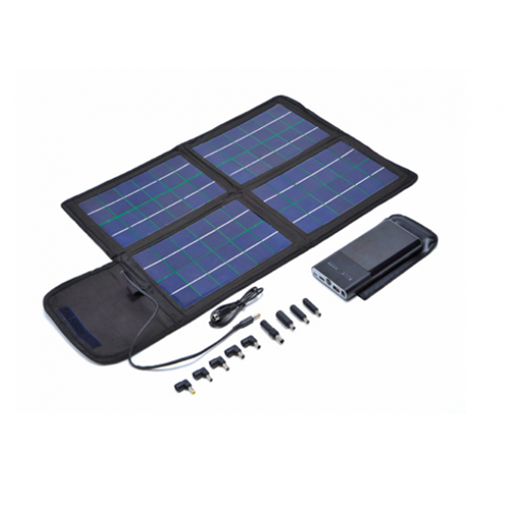 The Sun-In-One™ 20 Watt Solar Charger provides the ability to fully recharge laptops, ipads, tablets, cell phones, MP3/MP4, portable DVDs, and other small electronic devices in as little as 3 hours. The portable rechargeable Li-battery (included) can be fully recharged by the solar panel in as little as 3-5 hours of sunlight or by plugging the AC adapter (optimal) into an outlet, or into a car charger. Emergency power for your devices when you need it. The Sun-In-One™ 20 Watt Foldable Solar Charger is perfect for business travelers, salespersons on the go, electricians, carpenters and other tradesmen without any access to outlets, even home owners who’ve lost power in a storm. The foldable solar panel is lightweight, compact (8”x11.5”x2” folded) and easily fits in a briefcase or purse. The Sun-In-One™ 20 Watt Foldable Solar Charger is protected by a waterproof and durable cloth lining on the outside and has a shoulder strap for easy carrying. An AC adapter, DC Power Connection Barrel Plugs and a variety of charging outputs to accommodate most digital devices are also included. With the Sun-In-One™ 20 Watt Foldable Solar Charger you will never run out of power again when you need it the most!